Visiting Mostar in Bosnia and Herzegovina was an eye-opening and humbling experience. When we traveled to Croatia, we took a day trip to Mostar. We had a rental car for our entire vacation, and Mostar is just a short two-hour drive from Dubrovnik. We were very interested in visiting the Muslim mosques and, of course, seeing Stari Most, the Old Bridge. Crossing the border into Bosnia and Herzegovina from Croatia by car was very easy. Finding our way to Mostar was simple with an international GPS. We parked our car in a huge parking lot behind the Franciscan Church of Saints Peter and Paul and started our tour of Mostar. While we were prepared to see signs of the war, actually seeing them in person was very startling. We had been in Dubrovnik for a few days, which had also been directly hit by war, but everything there has been rebuilt. So Mostar was our first sighting of bullet hole ridden and gutted buildings in ruins. Living in a country where home-based wars are in our far past and current wars are an ocean away, it was very sobering to see physical manifestations of war everywhere and realize that the people of Mostar, and many other areas of the former Yugoslavia, lived with war raging around them daily. Reminders of war are everywhere in Mostar. 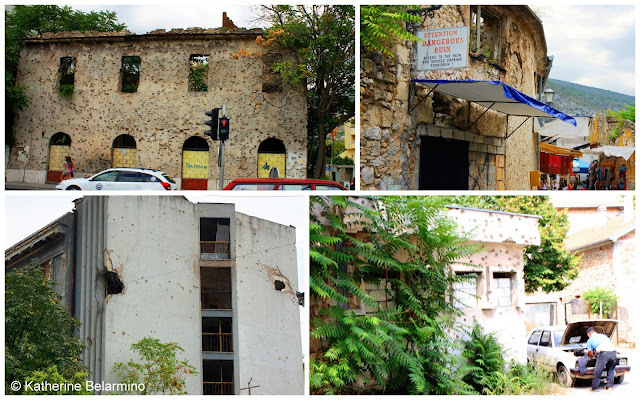 A walking tour of Mostar consists of an L-shaped path starting at the church, crossing Bulevar, heading down Onescukova Ulica, traversing Stari Most, and turning left and continuing down Kujundziluk. Walking down Onescukova Ulica, I worried Mostar was going to be strictly tourist, as the street was lined with shops selling trinkets. After our day in Mostar, I can say it is very touristy, but not in a way that should be a turnoff to visitors. Since we only spent a day in Mostar, we didn’t get to see it after all the day-trippers, like us, left for the evening, but I have read it is spectacular, especially lit up at night. 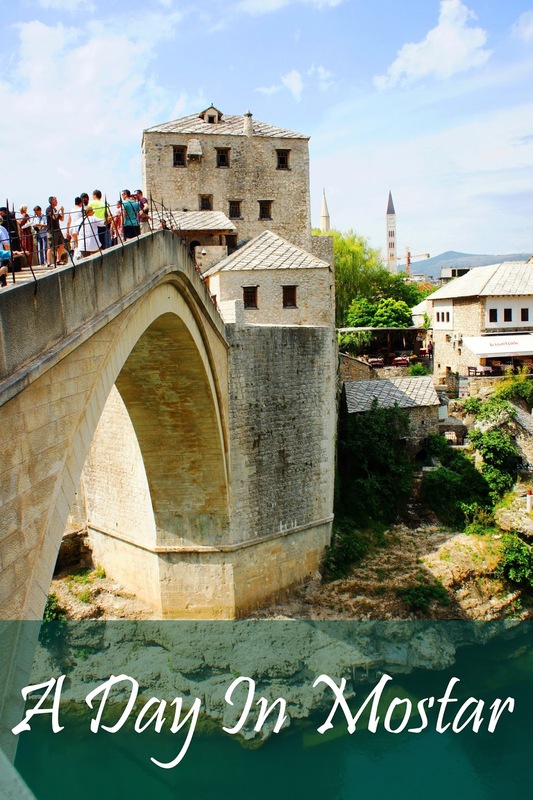 After walking through the street of shops with multitudes of colorful items for sale, we reached our first site, the famous Stari Most, the Old Bridge. This striking single-arch stone bridge was built from 1557 to 1566. There are large towers on either side of the bridge, one of which houses a museum. The sad history of the bridge is that while it was able to stand for over 400 years and even withstood the weight of Nazi tanks, in 1993 the bridge was shelled and collapsed into the river below. Amazingly, after the war ended, the bridge was rebuilt with stone from the original quarry in the exact way it was built so long ago. Nowadays, local young men hang out on the bridge in speedos waiting for someone to pay them to jump into the chilly Neretva River below. A large number of visitors to Mostar on the day we were there were older. It pained me to watch them cross the bridge, as it looked incredibly difficult and like they could fall and break something at any moment. It is steep, smooth, and slippery. The mistake most commonly made was people were stepping in between the raised ridges. You actually want to use those raised ridges to step on to help cut the steepness of the bridge somewhat. 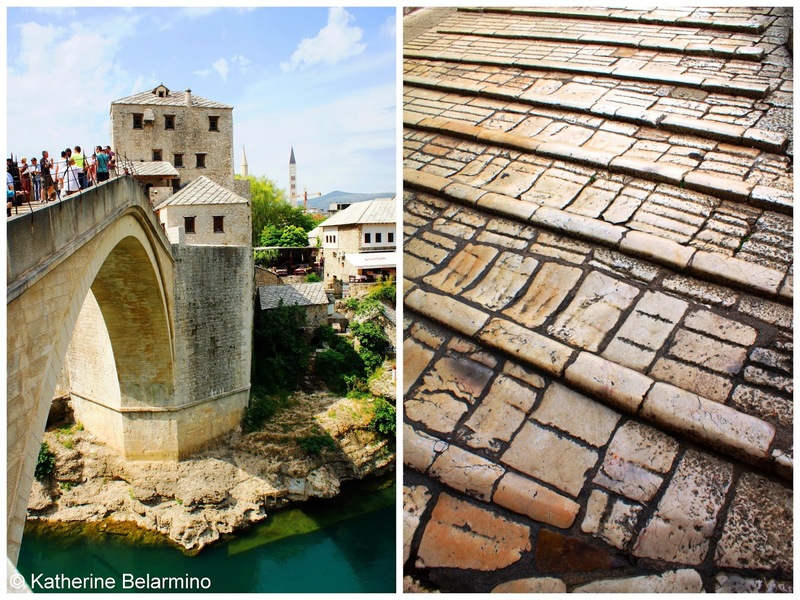 Stari Most (Old Bridge) and its hazardous path. After taking in the view from atop the bridge and touring the bridge’s museum, we visited our first mosque, Koski Mehmed-Pasha Mosque. The nice thing about visiting the mosques in the more touristy part of Mostar is that they are a little more lenient with visitors. Still wear modest clothing (which can be difficult when it is so hot), but women are not required to wear scarves and it is not necessary to remove your shoes. The grounds of Koski Mehmed-Pasha Mosque offer a beautiful view of Stari Most. You can also climb to the top of the minaret for another stunning view. The mosque was the first I had ever entered and was very different from any other place of worship I had visited. Muslims do not make images of living creatures in mosques, so the colors of the mosque’s interior were created from colorful rugs and bright painted forms on the white walls and ceilings. Interior of Koski Mehmed-Pasha Mosque. Colorfully painted dome of Koski Mehmed-Pasha Mosque. The grounds of Koski Mehmed-Pasha Mosque provide a wonderful photo opportunity of Stari Most, especially if you are lucky enough to find a fellow traveler who knows how to frame a shot. After visiting the mosque we veered away from the main tourist drag one street over to the New Muslim Cemetery. Before the war, it was a park. But during the war, the more exposed cemeteries were unusable because visitors were visible to snipers, so this tree protected park became a cemetery. Visiting the cemetery was moving and heart-wrenching. Every single tombstone is dated 1993, 1994, or 1995. I think this hit me even more than the buildings riddled with bullet holes and the completely gutted buildings with full-grown trees growing up the middle. I’ve always been a fan of cemeteries because I like to feel the people buried there had long fulfilling lives surrounded by people that loved them enough to build memorials to them. 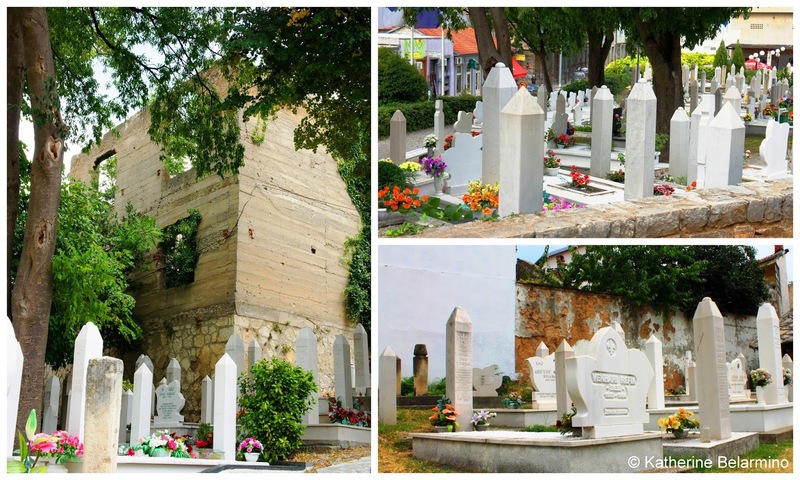 The occupants of these tombs had their lives stolen away from them far too soon. New Muslim Cemetery, a public park turned war graveyard. Being outside of the main tourist street kind of took me out of my comfort zone. I didn’t feel unsafe, but I did feel like an outsider. The residents stared at us, and I couldn’t tell what they were thinking. Another reason we strayed from the main street was to visit the Museum of Herzegovina. Unfortunately, this wish was denied. Something that also happened to us frequently in Dubrovnik was that the museum did not have change for our money. I have never encountered this elsewhere. I felt like Pretty Woman, except instead of being denied the opportunity to shop, I was denied the opportunity to visit a museum. Seriously, does it get any nerdier than that? If at all possible, acquire small change to pay entrance fees, though in my experience, this is easier said than done. Our next stop was the Biscevic Turkish House, one of Mostar’s traditional Turkish-style homes that are open to visitors. The house was built in the 1600s and has beautiful woodwork on the inside and intricate river stone work on the outside. There is even a box of traditional costumes that can be tried on for pictures. However, somebody who will remain nameless wouldn’t play dress up that day. Interior of Biscevic Turkish House. Note the old photo on the wall, which is of the exterior of the home. The outdoor area of Biscevic Turkish House. I loved the use of river rocks throughout Mostar. Our last stop was Karadozbeg Mosque. This mosque was built just before Stari Most was started. It was simpler and not as colorful as the first we visited, but was still beautiful and has retained some if its original decorations. There is a cemetery adjacent to this mosque, also filled with tombstones from the war. On the way back to the car we did a little souvenir shopping. There are many different types of articles to choose from, including hammered-copper items, rugs, scarves, and war remnant paraphernalia. Also be sure to try borek (or burek), a traditional street food made with spiraled crispy phyllo dough filled with cheese and meat. I felt Mostar was a little different from the typical day trip destination. Later in our trip we encountered some travelers who were deciding whether or not to go to Mostar, and when I responded to their question of if it was worth it, I hesitated. They took that to mean it wasn’t and decided not to go based on my hesitation. Mostar is beautiful and has very different sites with its bridge, mosques, and Turkish-style homes. However, for me, it was also about learning a little about a culture I am very unfamiliar with and reflecting on a difficult not-so-distant past of war, something I hope I will never have to experience personally. I used Rick Steves’ Croatia & Slovenia to plan our day trip to Mostar. This post contains affiliate links. If you purchase or book through them you pay nothing extra and they help fund our travels so we can bring you more travel stories.